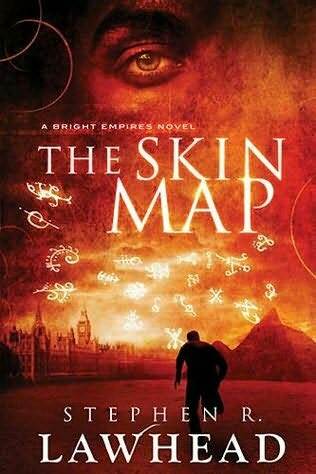 The Skin Map is the first novel in the Bright Empires fantasy series. Stephen R Lawhead is widely known for many of his other series; including the Pendragon series, the Celtic Crusades , and the Song of Albion . While the novel's underlying messages lean to the serious side in terms of discovering the secret of life, saving numerous lives, and finding true paradise, the novel reads very light, fun, and is incredibly engaging! Kit is down on his luck in present-day London, when out of the blue he is visited by his supposedly deceased great-grandfather Cosimo. Cosimo presents to Kit the way of traveling through ley lines, which resemble supernatural railroads that allow one to time-travel and visit alternate dimensions. Kit then shows this magical way of jumping through time to his girlfriend Wilhemina. The two become lost in time and separated from each other and the rest of the novel describes their adventures apart. 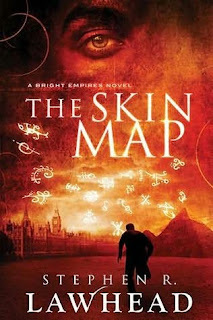 Lawhead also weaves a whirlwind of various other characters into the novel which all have their own important roles to play in the quest for the Skin Map; a map tattoed on someone's old skin that displays all the known ley lines leading to the ultimate Paradise that humanity has sought out since the near beginning of time. The Skin Map flows quite nicely, making it difficult to tear yourself away. The novel is divided up very smartly between the action-adventure of Kit's side of the story, and Wilhelmina's ambitious and modern business-savvy practices, which she implements in London during its more ancient times. I love how Lawhead introduces us to a plethora of other characters but keeps us hanging as to their exact roles in the novel until the end. Lawhead also touches base on a novel concept that time-travel books won't normally discuss; which is the concept of causing a massive rift and butterfly-effect in times past. Kit and Cosimo debate the morals of changing history in terms of good deeds for the greater good. Why can't one change history if it ensures saving hundreds and thousands of lives? As a reader, the only frustration comes from some rather abrupt finales without explanations which I'm sure will be sated in his next Bright Empires novel, The Bone House, which at this time does not have a release date. I felt a tremendous surge of pride at the end of The Skin Map when certain characters come to the rescue. For the sake of protecting spoilers, I'll not divulge much more, but I can promise that all lovers of fantasy and amazing storytelling will appreciate and enjoy The Skin Map . Check out the novels below, which are all firsts in Stephen R Lawhead 's other fantasy series. I saw this book at the library the other day... I really enjoyed the King Raven trilogy but haven't read any of his other stuff. I was reluctant to pick up a book I haven't read a review on yet, but your review makes this book sound good so maybe I should move it up on my to-be-read list. Great! It's definitely worth the time...I'm going to host a giveaway on this book in a few weeks. It surprised me and I'm definitely reading the sequel.